Life will always find a way and no matter whether you thought you were done with Jurassic World Evolution or not, a brand new premium piece of content is on its way – and it’ll be bringing new locales, challenges, story and dinosaurs! The Secrets of Dr. Wu is a new piece of premium DLC that will be hitting Jurassic World Evolution on Xbox One, PS4 and PC, with it dropping on November 20th 2018. Announced today by Frontier Developments, the Secrets of Dr. Wu expands the Jurassic World Evolution campaign with new missions and an all-new Jurassic World story, putting players in control of two hidden research facilities – one on Isla Muerta and the other on Isla Tacaño. These house the work of one Dr. Henry Wu, voiced by BD Wong, who is developing a new generation of hybrid dinosaurs. As you may expect, you’ll be confronted with a level of chaos and threat not previously seen in Evolution, with it all caused by Wu’s machinations as they work alongside the doctor and discover new dig sites, facility upgrades and research opportunities. 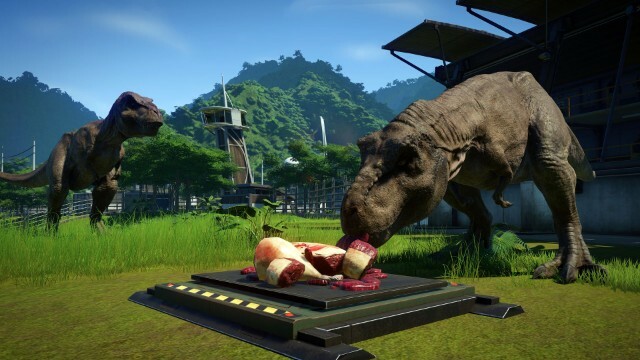 The Jurassic World Evolution: Secrets of Dr. Wu content pack also introduces us to the herbivore Olorotitan, the venomous Troodon, and three new Wu-created hybrids: the Stegoceratops, Ankylodocus and Spinoraptor. By progressing through Jurassic World Evolution: Secrets of Dr. Wu, you will find new missions to unlock, new upgrades and research options in place and the chance to check out the Indominus Rex’s unique camouflage gene as seen in 2015’s Jurassic World. What’s more, new campaign missions unlock after players achieve a four-star rating on Isla Muerta, whilst all Jurassic World Evolution players (no matter whether you purchase this content or not) will receive a free game update introducing an optional day/night cycle to the campaign, new dinosaur grouping and sleeping behaviours, new contracts and new large-capacity feeders. Jurassic World Evolution: Secrets of Dr. Wu will arrive for $14.99 (or your local equivalent), hitting Xbox One, PS4 and PC digital stores on November 20th 2018. You’ll obviously need the base game to hand to make the most of this content. If you haven’t yet played Jurassic World Evolution then you are missing out on something pretty damn special. Make sure you check out our review and then, at the very least, consider a purchase of the game.